One important factor in the design of overhead transmission lines is the calculation of the sag and tension of the conductor. This calculation includes the measurement of the conductor creep, defined as the inelastic stretch, or permanent elongation, of the conductor material when subjected to stress. Measurement of creep, which is conducted according to the IEC 61395 standard, involves a non-interrupted creep test for stranded conductors used in overhead transmission lines. 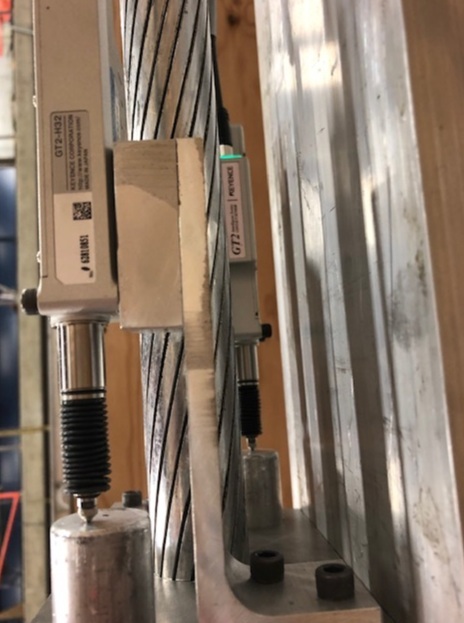 The conductor is tensioned on a creep test frame to 20% of the rated tensile strength (RTS) of the load, and the load is maintained for 1,000 hours according to the test standard. Creep and conductor temperature measurements are taken from the moment the full load is applied. The conductor temperature is measured in the middle and at both ends of the gauge length during the test. The test and conductor temperature are maintained at 20±2ºC. Higher load capacity—our creep test frame’s load capacity is higher than other labs, with maximum load capacity of 200,000 pounds. Load control—hydraulic load control enables smooth conductor load increase and within the 5-minute load-up timeframe indicated by test standard. High-accuracy strain measurement—high-accuracy contact sensors measure conductor strain to nearest 3 x 10-6, more accurate than the standard, which requires 5 x 10-6. Custom tests—testing to other standards available, or nonstandard creep tests accommodated at higher loads (e.g., 25% to 85% RTS), shorter durations, or other temperatures. Controlled temperature—high-efficiency cooling and heating system allows temperature controlled to ±2ºC. Conductor Setup—distance between end-fitting and gauge length easily adjusted in test frame to meet test standard requirement. Stress/strain analysis—capabilities are available for conducting stress/stain analysis, in addition to creep test, thus providing at once all design information needed by OEMs. Clients are welcome to witness creep testing, and Powertech provides all raw data, along with a final report of results. Powertech’s Mechanical Technology and Testing Group has extensive experience in many areas of mechanical testing—from research and development to consulting to failure analysis. We work closely with clients in the electric utility, automotive, electronics, and other industries to verify the performance of prototypes in advance of product release and also conduct failure analyses when problems arise.